DIE Veneris, 19 die Octobris. Spurrier, L. Crew's Servant, assaulted. Jackeman and Dodford sent for. L. Holles, Privilege. Skelling to attend, for taking Possession of his House. Hodie 2a vice lecta est Billa, "An Act against importing Cattle from Ireland and other Parts beyond the Seas, and Fish taken by Foreigners." ORDERED, That this Bill be committed. ORDERED, That this Bill be committed to a Committee of the whole House; and to be taken into Consideration on Monday Morning next: And the Committee hath Power to receive any Petitions as shall be presented concerning this Bill. 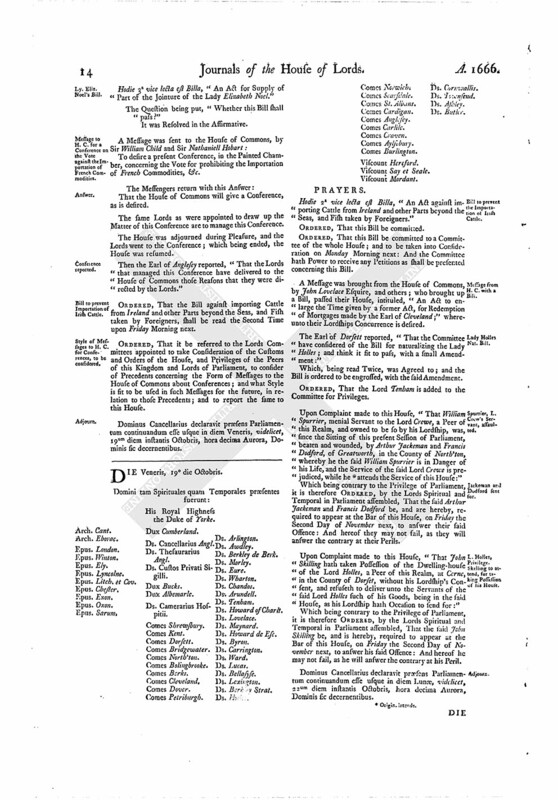 A Message was brought from the House of Commons, by John Lovelace Esquire, and others; who brought up a Bill, passed their House, intituled, "An Act to enlarge the Time given by a former Act, for Redemption of Mortgages made by the Earl of Cleveland;" whereunto their Lordships Concurrence is desired. The Earl of Dorsett reported, "That the Committee have considered of the Bill for naturalizing the Lady Holles; and think it fit to pass, with a small Amendment:"
Which, being read Twice, was Agreed to; and the Bill is ordered to be engrossed, with the said Amendment. ORDERED, That the Lord Tenham is added to the Committee for Privileges. Upon Complaint made to this House, "That William Spurrier, menial Servant to the Lord Crewe, a Peer of this Realm, and owned to be so by his Lordship, was, since the Sitting of this present Session of Parliament, beaten and wounded, by Arthur Jackeman and Francis Dodford, of Greatworth, in the County of North'ton, whereby he the said William Spurrier is in Danger of his Life, and the Service of the said Lord Crewe is prejudiced, while he (fn. 1) the Service of this House:"
Which being contrary to the Privilege of Parliament, it is therefore ORDERED, by the Lords Spiritual and Temporal in Parliament assembled, That the said Arthur Jackeman and Francis Dodford be, and are hereby, required to appear at the Bar of this House, on Friday the Second Day of November next, to answer their said Offence: And hereof they may not fail, as they will answer the contrary at their Perils. Upon Complaint made to this House, "That John Skilling hath taken Possession of the Dwelling-house of the Lord Holles, a Peer of this Realm, at Cerne, in the County of Dorset, without his Lordship's Consent, and refuseth to deliver unto the Servants of the said Lord Holles such of his Goods, being in the said House, as his Lordship hath Occasion to send for:"
Which being contrary to the Privilege of Parliament, it is therefore ORDERED, by the Lords Spiritual and Temporal in Parliament assembled, That the said John Skilling be, and is hereby, required to appear at the Bar of this House, on Friday the Second Day of November next, to answer his said Offence: And hereof he may not fail, as he will answer the contrary at his Peril. Dominus Cancellarius declaravit præsens Parliamentum continuandum esse usque in diem Lunæ, videlicet, 22um diem instantis Octobris, hora decima Aurora, Dominis sic decernentibus.